In this week’s Talent Trends we’re looking at what our candidates believe is most important in order to achieve success! We’ve collected the data from another of our personality questions that feature in TalentPool’s sign-up process. The feedback we’ve received from candidates has been interesting and perhaps not what we would have predicted! 32% believe that building strong interpersonal relationships is the key to success at work. 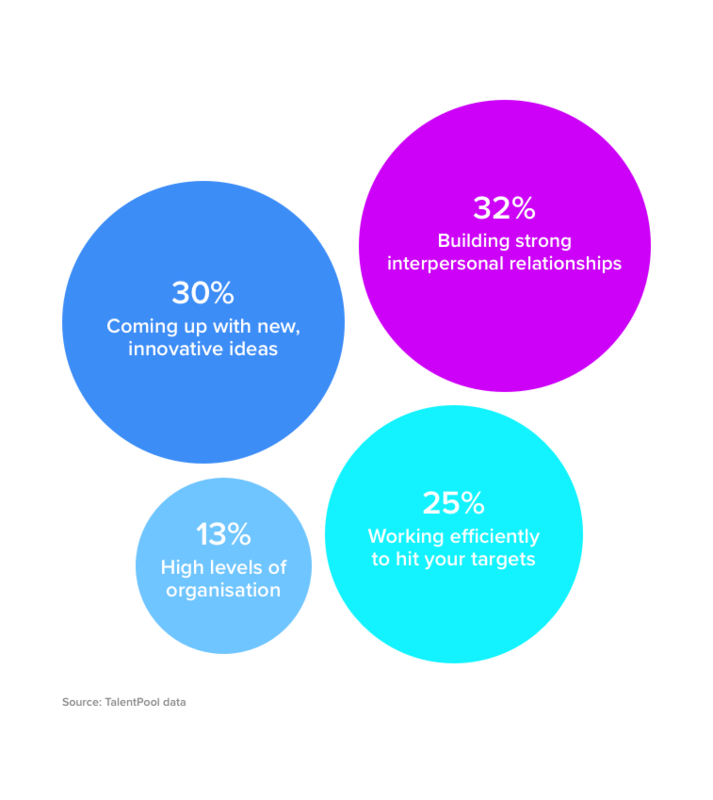 Closely followed by 30% of candidates who believe success relies on coming up with new, innovative ideas. Working efficiently to hit targets was chosen by 25% of candidates and coming in at the bottom was high levels of organisation, which was chosen by only 13% of individuals. With building strong interpersonal relationships coming out on top, we’re able to see that our candidates don’t think solely about the technical side of work, they’re also considering the importance of teamwork and collaboration, both of which can often only be achieved if we are to have good working relationships with our colleagues. Perhaps a more conventional response comes from the 30% of candidates who believe that success is down to coming up with new and innovative ideas. It’s not a big surprise that this was the second most popular response as many would argue that innovation and the creation of new products and processes are what successful companies are built on! What is rather surprising, is that the more practical approaches to success; working efficiently to hit your targets and high levels of organisation were chosen by only 25% and 13% of candidates respectively. This week’s podcast focuses on more personal methods of developing your business including mindfulness, psychology and managing your feelings. This article is rather uplifting and reassuring for London’s start-up community. It looks at the growth in the number of start-ups in London over 2018 (a 6.45% increase on 2017!) and predicts a similar trajectory for 2019 despite Brexit’s anticipated impact. The Guardian looks at a recent study which suggests that school leavers should apply to universities after receiving their A-levels as a means of avoiding controversial unconditional offers. They argue that the move would end many of the uncertainties that arise during the wait for university responses and A- level results. If you enjoy reading the articles that have got us talking at TalentPool, be sure to follow us on LinkedIn where we post our opinions on thought-provoking articles and topics regularly!